Is it a Depression-era mobster tale? A dark comedy? A horror comic? 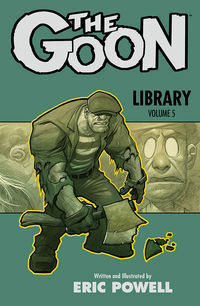 Eric Powell's Eisner Award-winning The Goon is all of this and more, a completely unique series that debuted in 1999 and is published by Dark Horse Comics. Set apart by Powell's painterly art and a moody, muted color palette by Dave Stewart, The Goon comics and graphic novels follow the adventures of the Goon, a scarred, taciturn mob enforcer, and Franky, his loyal right-hand man. Join them as they battle monsters, witchcraft, and the occult! At TFAW.com, we carry a full inventory of The Goon merchandise, including graphic novels, Zippos, lunchboxes, and more. Explore this page to buy the hottest Goon comics and collectibles! Legal Notice: Entire contents trademarked (® or TM) and copyrighted (©) 1986-2019 by Things From Another World, Inc. and respective copyright and trademark holders. All rights reserved. Page rendered at 2019-04-22 07:13:26 in 0.724 seconds.